Rev. Bob Bond, Niagara Health Coordinator of Spiritual and Religious Care, was recently recognized with the Verda Rochon Award for Distinguished Service by the Canadian Association for Spiritual Care (CASC). Bob received the award at the association’s annual conference in Deerhurst, Ont. The award is CASC’s highest honour and to confer it upon Bob is to recognize his decades of outstanding work. The presenters commented on Bob’s extensive clinical practice, his role as educator for medical learners with McMaster University’s Michael G. DeGroote School of Medicine and his political advocacy. Bob has led CASC’s engagement with the government and with other professions towards the creation and ‘inhabitation’ of the College of Registered Psychotherapists of Ontario (CRPO). 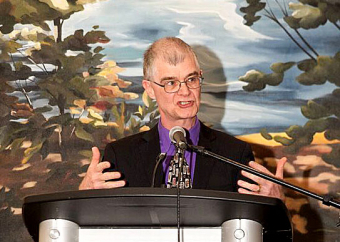 As a representative of CASC to the Ontario Alliance of Mental Health Practitioners (OAMHP), then as the Alliance’s Advocacy Chair, now in his fifth year as OAMHP Chair, Bob actively engages the Ministry of Health to clarify the essence and importance of psychotherapy - and of spiritual care within psychotherapy - as a crucial modality within healthcare. Also, energized by his core belief that poverty is a key determinant of health, Bob has worked extensively for local anti-poverty initiatives and community care such as Out-of-the-Cold and Harvest Kitchen. Bob has nurtured partnerships between Niagara Health and diverse local faith communities. Bob’s compassionate and insightful professionalism has touched countless lives of patients and their loved ones, staff, physicians and volunteers. Learn more about our Religious and Spiritual Care team here.